I told myself my 15 lb harbor freight anvil would not do it but I went for it anyway. 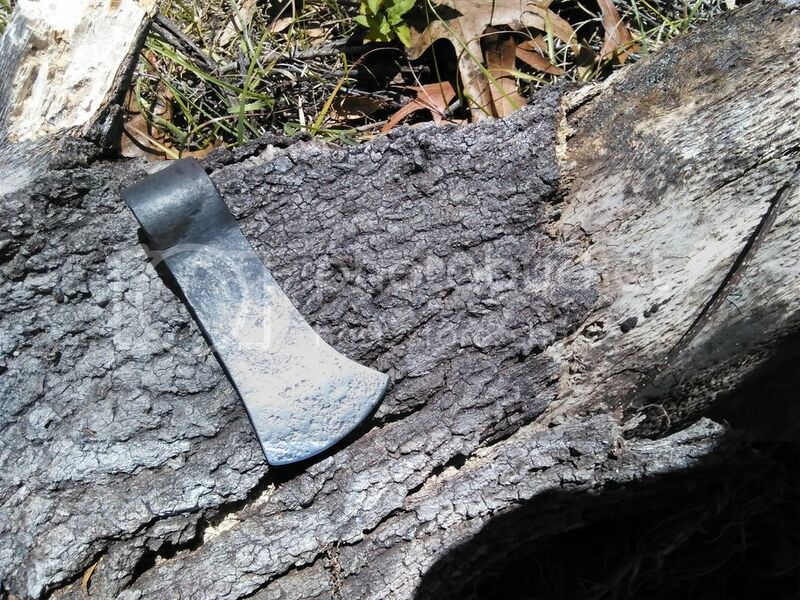 Tomahawk head made of 1075 knife steel. 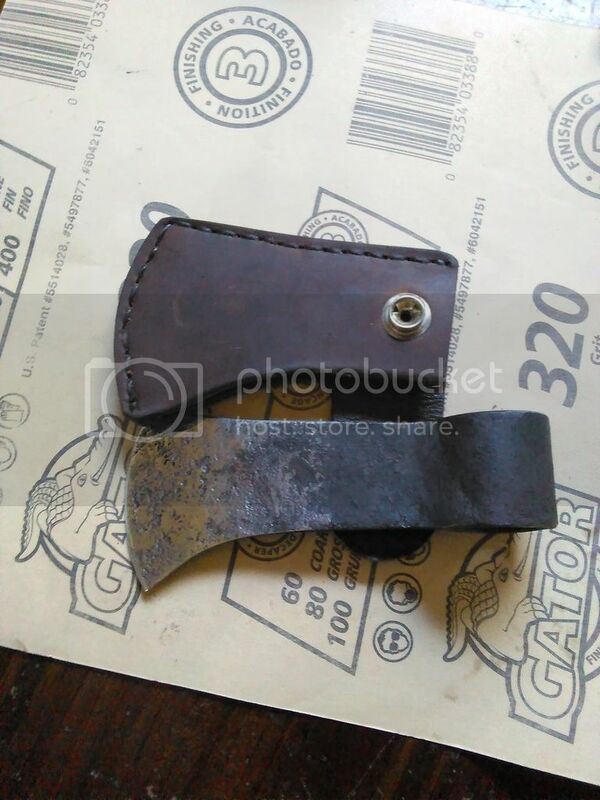 Forge welded together with lots of heat and borax I am very happy with the results just need to make a leather mask for it. Super job! 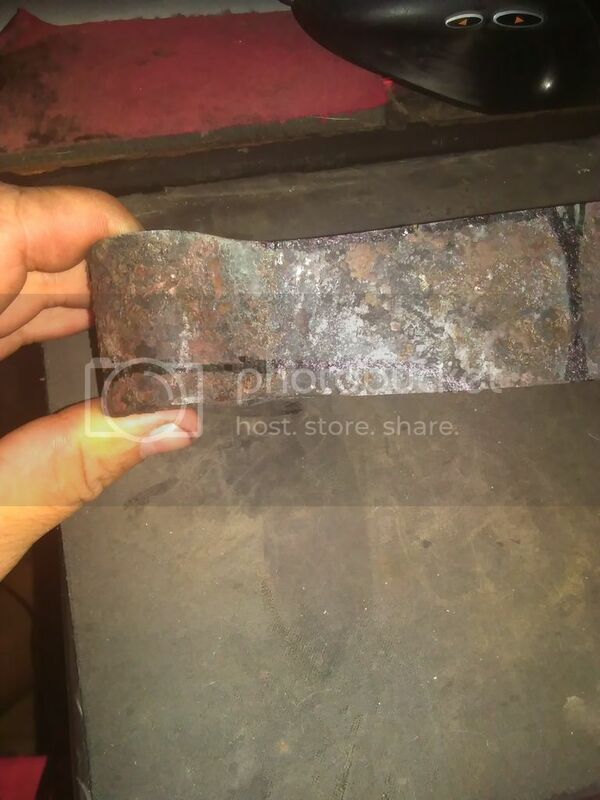 For those who don't do smithing, a forge weld is not easy and a large one is especially difficult. Getting the entire area fluxed and properly seated for the final forging is a black art. Well done, Sarge! Thank you yeah it was interesting to say the least getting sprayed by molten laundry detergent but my clothes smelled fresh. 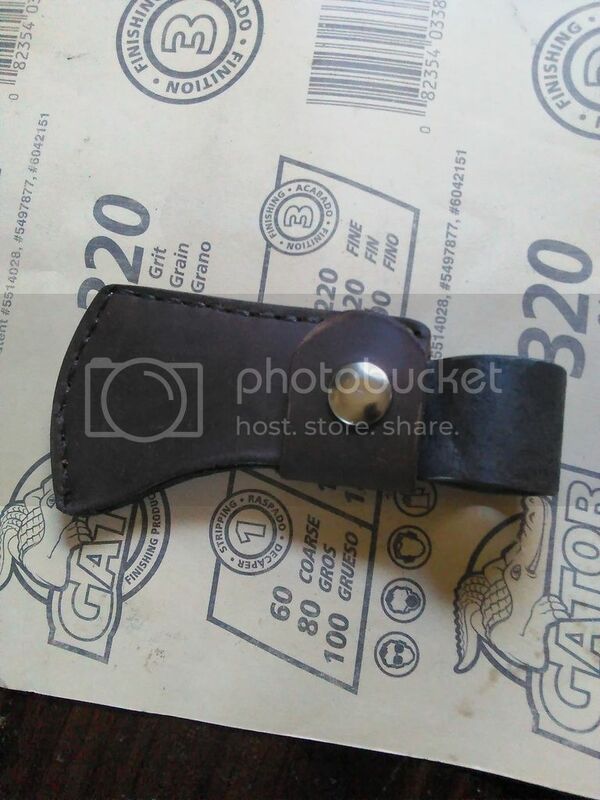 I decided to make a mask/sheath for it as well out of some hobby lobby scrap my first time putting a button on leather as well. Nice! Get that thing hafted! Did you use some kind of mandrel to get the taper in the eye? Very nice work......especiall y for a guy that is new to the game. I am very impressed! That turned out great. Looks like you've been at it for a while. Well done. That's awesome. 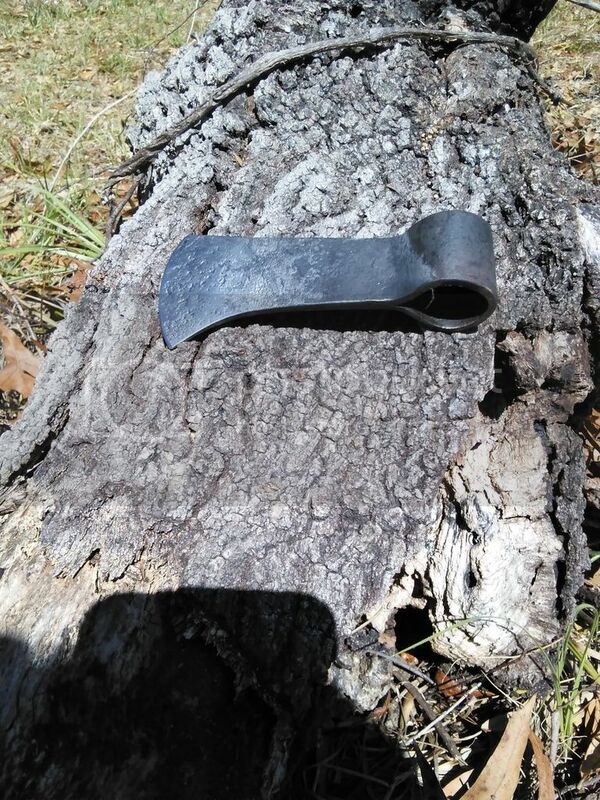 I've done very little hammerin' but I hope to forge a hawk one of these days. Great job , nothing wrong with that at all ! Very nice looking forward to it finished and a little testing. 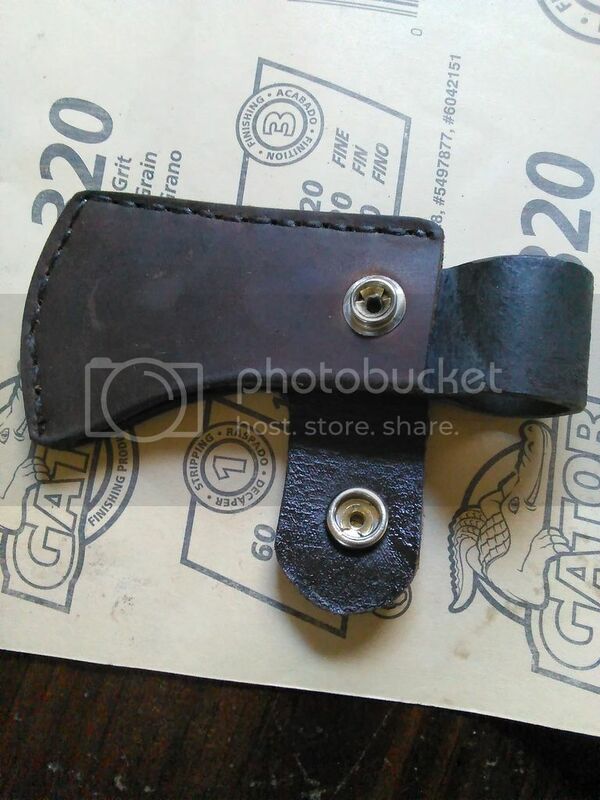 The sheath looks great also. Well done, looks like you have a natural talent for it. 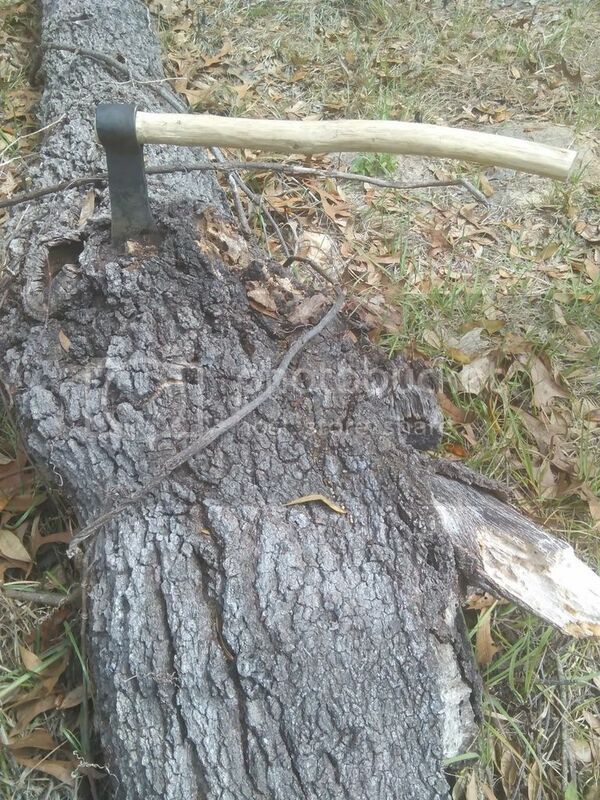 Went out back and found an oak branch that would work for a temp handle enough to do some testing. It sure holds and edge and will chip down wood pretty quick. SgtMcBoom, don't use 20 Muleteam Borax or Boraxo soaps. Look for plain old Borax with no additives. Also, I did not see anything about the heat treatment. I heat treated it like I do any of my knives. I bring the head to non magnetic and then dunk the edge in this case 2 inches deep directly into the cooking oil for 2 second then dunk the rest of it in there. Then after I just clean everything off of it I use a small oven I have set up for tempering and put it in the oven at 400 degrees for 2 hours then pulled it out and dunked it into room temp water. Its 1075 steel so it is usually pretty forgiving for heat treating. I only found 20 muleteam Borax at the local dollar general. I may have to try Walmart or a place with a wider selection. I have seen plenty of videos where they use the 20 mule team Borax as there flux of choice I did not know there was anything different I will keep an eye out. OK, sounds right as rain. I think I found the borax at Walmart but I can't remember for sure. Awesome! Good choice on the steel too! Looks like it fell out of Meriwether Lewis' pocket! Where do you get 1075 Steel plate? Mostly all I see is flat bar and round bar. I put a new handle on this and now it looks so much better. 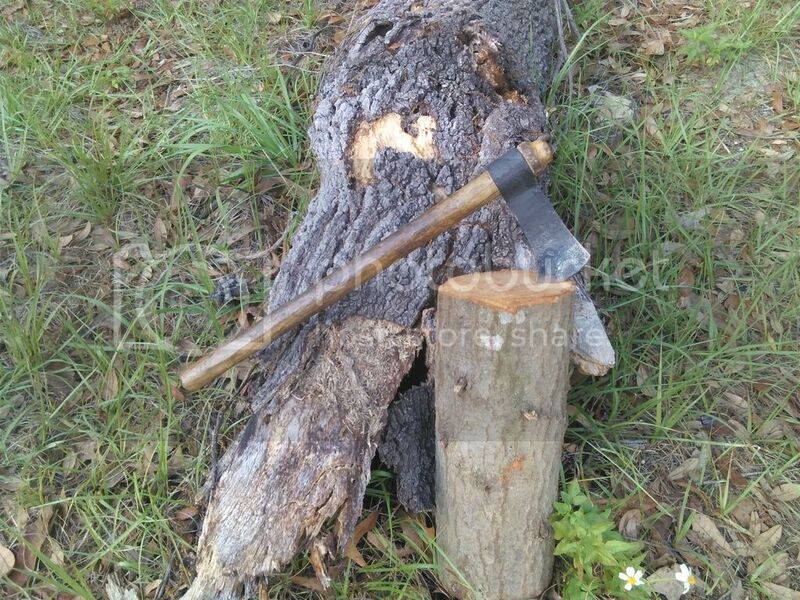 Well "new" as in old hickory handle from a old tool that was broke hand whittled down to the right size. That turned out real nice. I like the handle, looks like it's been there for a long time.